In the last section we studied about some of the frequently used motor electrical parameters in our day to day work. We have already understood about the different types of AMPS rating that a motor nameplate have, in this post we will try to understand about the design of motor that is what type of torque and speed curve motor have, we will also look in to efficiency, frame size, and frequency. Subscribe to Automation-Talk by Email. There are generally four types of design A B C D that an AC Motor can have. 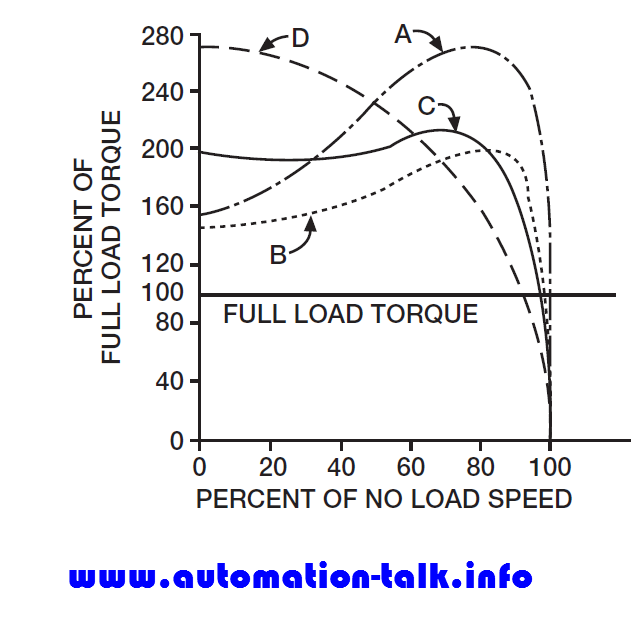 The design of AC Motor just indicates the type of speed v/s torque curve that the motor will have. 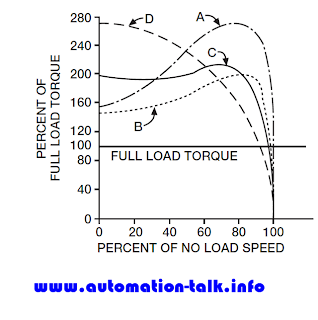 The speed v/s torque curve for all the designs of the motor is below. The standard industrial motor will mostly have the design B, it has reasonable starting torque with average speed and starting current with a good performance. In the above curve, we see that design C has the high starting torque so this type of motor is used where we have to start the high loads. Design D is the so-called high slip motor which tends to have very high starting torque but has high slip RPM at full load torque. Design D motors are generally suited for press and elevator applications. Design A motors are not particularly specified but are used where the high pull out torque is required. What does efficiency of AC Motor Means? Efficiency is indicated on the nameplate of the motor and in simple terms, it means that it is the amount of input energy that is converted into work. We should always select a motor that has high efficiency. As everything in this world has some size, same is the case with the motors. As the motor HP increases or RPM decreased the frame size of the motor increases. NEMA (National Electrical Manufacturers Association) has prescribed standard shaft diameter for the particular frame size so as to maintain a standard among all the motor manufacturers in the world. Frequency on the motor nameplate means that for which input frequency motor is designed to operate. Most common motors have operating frequency of either 50 or 60 Hz. We have understood some of the more common electrical terms in this post. 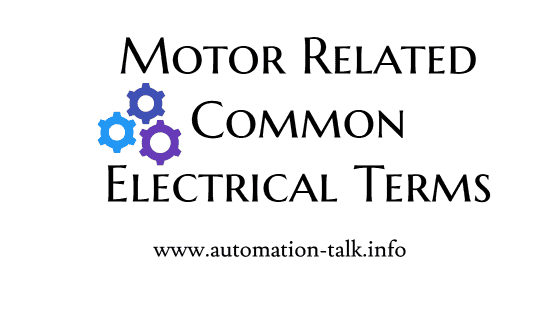 We will also cover other commonly used electrical motor parameters in the upcoming post. If u have any doubts at any point please feel free to write in the comment section.